Our "Best Team Name" challenge led to much heated debate among the Selection Committee. We are already working on a new voting system for 2019 as it required several ballots to finally reach a consensus on the 2018 winner. Congratulations to the Wobbly Gobblers! The team will also receive a Pizza Luce gift certificate. It's not too soon to begin working on your team name for 2019. We had so many good ones to choose from that next year we are going to give awards for first, second, and third in this division. Some of the favorites from this year included Poutry-geists, Feast Mode, Mashed Couch Potatoes and Kickin Asphalt. Thanks to all who participated. 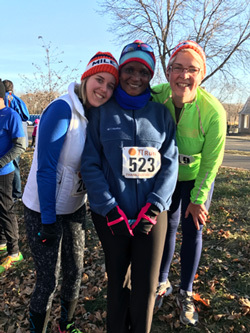 Thanks to all who participated in the 2018 Drumstick Dash Thanksgiving Day Events. We are finalizing the team results and they will be posted here by November 30. Mark your calendars now for 2019 - November 28, 2019 is Thanksgiving and Drumstick Dash Day. Drumstick Dash is pleased to announce that Mile in My Shoes is continuing as our Charity Partner in 2018. Mile in My Shoes (MiMS) brings people from diverse backgrounds together through the power of running. MiMS run mentors are paired with people experiencing homelessness and other barriers. Drumstick Dash participants can support MiMS through direct donations at registration and also as FundRacers. FundRacers receive a FREE entry to this year's Pi Run or Drumstick Dash 10k. By signing up to "FundRace" for Mile in My Shoes, you will get a free entry in exchange for fundraising just $100 - and the more you raise, the more prizes you get - including an exclusive Drumstick Dash hoodie! For more info, and to register as a FundRacer - and get your code for your free entry, visit Mile in My Shoes.